Buddhism and psychedelic exploration share a common concern: the liberation of the mind. 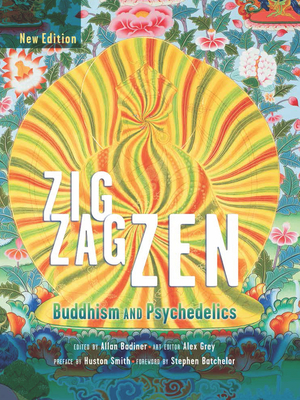 This new edition of Zig Zag Zen: Buddhism and Psychedelics has substantially evolved from the landmark anthology that launched the first serious inquiry into the moral, ethical, doctrinal, and transcendental considerations of the intersection of Buddhism and psychedelics. A provocative and thoughtful exploration of inner states and personal transformation, Zig Zag Zen now includes an expanded display of stunning artwork from Android Jones, Sukhi Barber, Randal Roberts, Luke Brown and Ang Tsherin Sherpa, and more work by the pioneering visionary artist Alex Grey. Complementing these new images are original essays by such luminaries as Ralph Metzner and Brad Warner; exciting interviews with James Fadiman, Kokyo Henkel, and Rick Doblin; and a discussion of ayahuasca's unique influence on Zen Buddhism by David Coyote (six new text contributions in total); all of which have been carefully curated to extend the original inquiry of authors Joan Halifax Roshi, Peter Matthiesen, Jack Kornfield, Terence McKenna, Rick Fields and many others. Contemporary seekers of spiritual truth know that both Buddhism and psychedelics are inevitably subjects encountered along the journey. By examining them together, the reader can discover truth about the essence of each.